On the first two issues, he lauded the efforts being made by the legislature so far in the 2018 legislative session and even suggested that the package of transparency measures introduced by Democrats are deserving of support. Colyer also announced four transparency measures that his administration will take including no longer charging Kansans for open records requests of less than 100 pages, ensuring the Administration relies on official email accounts to conduct state business, instituting performance metrics for Cabinet Agencies so Kansans can see how they perform, and launching a website to serve as a one-stop-shop for Cabinet Agencies to post open meetings, locations and materials. The healthcare issue may be most challenging for Colyer – or may be an issue where he departs from his past positions – because he was a leader under former Governor Brownback in the establishment of the troubled KanCare system and refusal to expand Medicaid. We, of course, were waiting for what he had to say about education and addressing the Gannon decision. We were hoping that he would lead on this issue. The Legislature, as you know, appears to be stalled or simply refusing to seriously talk about the issue while the Court deadline and the deadline set by the Attorney General are rapidly approaching. 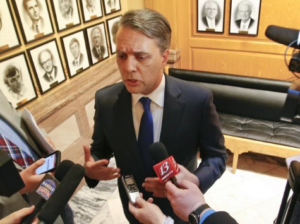 Unfortunately, Colyer gave little direction to the Legislature about what he would sign except to provide a “framework” of four broad thoughts he wants to see in the solution. He called upon the legislature to keep our schools open, permanently end school finance litigation, phase-in increased funding, and demand accountability and improved outcomes. Missing in his message was any mention of the level of increased funding he believes is needed. On my first day as governor, I had the opportunity to visit a public school in my hometown of Hays. I want you to know that your Governor is a supporter of public education. In Kansas, we invest in our schools, not because a court tells us to, but because we want to invest in our children and our future. We invest in teachers because they invest in our kids. We support things like the Kansans Can Redesign program because we are willing to do hard things for the youth of this state. And now I want you to think about something. Governor Bob Docking, Governor Bob Bennett, Governor John Carlin, Governor Mike Hayden, Governor Joan Finney, Governor Bill Graves, Governor Kathleen Sebelius, Governor Mark Parkinson, Governor Sam Brownback, and Governor Jeff Colyer. The last ten Governors of Kansas. Five Democrats and Five Republicans. Fifty years and counting. That’s longer than the Cold War. All ten governors have had the specter of education lawsuits overshadowing education. This must end now. To some in politics, leadership is about being a bully or being the loudest, shrillest voice in the room. To others, it’s about staking out a position and never compromising. To me, leadership is about setting a vision and bringing people together to achieve common goals. And, as a former legislator, I know that you don’t appreciate being told what to do by a governor or anyone else for that matter. And I think the reaction to a recent State of the State address is plenty evidence of that. Increased investments in K-12 Education must come through a phased-in approach that doesn’t increase the tax burden on Kansas families and ensures schools can effectively allocate any new funds they receive. I will sign school finance legislation that meets these objectives. This will not be easy, but public servants and leaders are not called to make the easy choices. We’re here to do the right thing, and the right thing is never easy. The House Education Committee held its annual dyslexia hearing, this time on HB 2602 which would mandate screening all children for dyslexia. Proponents generally blasted the public schools as knowing little about dyslexia, of refusing to provide support to children with dyslexia, and of not talking to or listening to parents. Opponents including USA, KASB, and Special Education Directors countered with all of the efforts being made on behalf of children under both Section 504 of the Americans with Disabilities Act and IDEA. 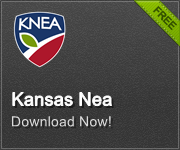 KNEA testified as neutral on the bill, raising concerns about its vagueness. The bill seems to suggest that all students shall be screened for dyslexia. There are, however, questions left unanswered. Are all students to be screened annually or is this a screening upon enrollment only? Is there an intent for there to be additional screenings later? If all students are to be screened as a matter of course, are schools prepared to conduct such screenings? Are there enough trained personnel in our schools to handle such screenings in a timely manner? If a school district screening suggests the child has dyslexia and the district then suggests that the student be evaluated by “a licensed physician, psychologist or psychiatrist” does the school district then have any obligation to pay for a follow-up evaluation? Desetti, as well as Rep. Steven Crum (D-Haysville) and Rep. Melissa Rooker (R-Fairway) noted that teachers in Kansas can now be non-renewed for battling with administration or the school board. Perhaps it is time to restore due process for Kansas teachers so that they can continue to advocate for the needs of their students.